$50 PARTY FEE PLUS THE ADDITIONAL PRICE OF YOUR POTTERY, MOSAICS, CANVAS, GLASS (Minimum $20 per item, $35 Canvas, $35 Clay Hand building & $75 POTTERY WHEEL -includes one pot) All guests participate. A dedicated Painted Pot or ClayHouse Brooklyn will host your party. By signing this statement you agree to the following with no exceptions: 1. All guests attending the party are required to participate. Non-participants will be charged $20 per person. 2. Please be prompt. If your party stays longer than the time permitted, a fee of $5 per painter. Please remember that art materials are hazardous to your health if ingested. 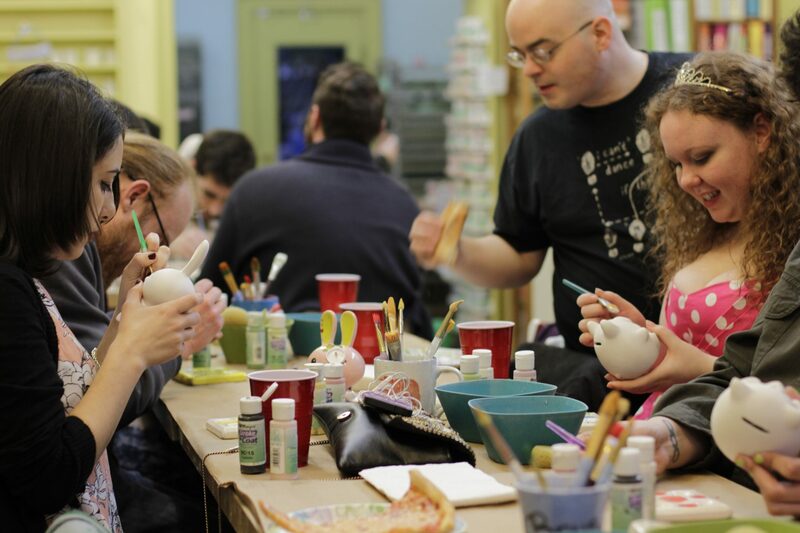 All of our glazes are non-toxic, but we still insist that you do not eat or drink while painting. At THE PAINTED POT, we have many breakables, so please caution your child not to run and be careful. If items are broken, we ask that you let staff know immediately so we can clean up the broken pieces. Customers are responsible for the cost of any broken items. THE PAINTED POT is not responsible for any injuries suffered from improper or unauthorized use of the materials in the store. THE PAINTED POT is not responsible for any lost or stolen personal property. will be charged every half hour. 3. FOOD: You are welcome to bring food. 4. PRIVATE PARTY: If your party is for 25+ painters, a private party will be permitted for additional fee of $325 - If painters do not show up or paint, you will still be charged for 25 painters at $20 each. 5. We do not allow piñatas, ice cream cakes or sparkler candles. 6. NO hard alcohol Wine and beer will be permitted. 7. NO moving tables or chairs without Painted Pot authorization. 8. NO outside brushes, palettes, bowls or other supplies will be permitted. 9. Our staff will supervise painting techniques and provide fun for all. We make a great effort to give personal attention to all guests. A gratuity of 20% to your party hosts is expected and greatly appreciated. 10. If possible, please book party in advance with a $100 NON-REFUNDABLE deposit. There is NO credit. 11. Parties can also be scheduled outside normal store hours for additional fee of $125. Please remember that art materials are hazardous to your health if ingested. All of our glazes are non-toxic, but we still insist that you do not eat or drink while painting. At THE PAINTED POT, we have many breakables, so please caution your child not to run and be careful. If items are broken, we ask that you let staff know immediately so we can clean up the broken pieces. Customers are responsible for the cost of any broken items. THE PAINTED POT is not responsible for any injuries suffered from improper or unauthorized use of the materials in the store. THE PAINTED POT is not responsible for any lost or stolen personal property. The Painted Pot welcomes parties for all occasions. Let us help you celebrate your next birthday, bachelorette, baby or bridal shower, company party, anniversary or any corporate event. Our beautiful studio will provide the perfect atmosphere for all your party needs and leave the cleaning to us! Our staff is here to supervise painting techniques and to provide fun for all. $50 PARTY FEE PLUS THE ADDITIONAL PRICE OF YOUR POTTERY, MOSAICS, CANVAS, GLASS (Minimum $20 per item, $35 Canvas, $35 Clay Hand building & $75 POTTERY WHEEL -includes one pot) All guests participate. A dedicated Painted Pot or ClayHouse Brooklyn will host your party. YOU ARE WELCOME TO BRING FOOD, BEVERAGES INCLUDING BEER AND WINE. Party package is available to parties of eight or more. All parties must be booked in advance with a $50 fee/deposit which is non-refundable. All guests attending the party are required to participate. Non-participants will be charged $20 per person. Parties with a minimum of 20 painters can also be scheduled outside normal hours for an additional fee of $75.00. Rent our beautiful studios for $325 an hour.